Lincoln, Neb. — Visitors to the 148th Nebraska State Fair Aug. 25 to Sept. 4 in Grand Island will celebrate the people, products and talent of the state. The fair is a chance for thousands of youth who participate in Nebraska 4-H – sponsored by Nebraska Extension – to share what they have learned and worked on throughout the year. "At the fair, we celebrate the success of thousands of youth who have learned and grown through 4-H," said Kathleen Lodl, associate dean of Nebraska Extension and 4-H program administrator. "It's also an opportunity for youth to discover areas they'd like to learn more about and meet other 4-H members with similar interests from across the state." Nebraska 4-H members will give a variety of presentations focused on agriculture Aug. 26 at Raising Nebraska. Past presentations have included topics such as popcorn and pig ear notching. This year, Chef Peter Dale will provide cooking demonstrations alongside 4-H youth Sept. 2 and 3. Dale, named "The People's Best New Chef Southeast" by Food and Wine magazine in 2012, has opened several restaurants including Empire State South, a southern farm-to-table restaurant in Atlanta. A new display at Raising Nebraska this year is "The Amazing Egg," an interactive experience in which visitors can discover the intricate structure of an egg, get an extreme close-up look at the surface of a shell and manipulate a virtual yolk. Visitors will learn how often a chicken lays an egg, how many eggs a chicken lays in a year and why some eggs are brown and others are white. Beyond 4-H activities, fair visitors can sample many Nebraska foods at the University of Nebraska-Lincoln's Food Processing Center display in the 4-H-FFA Building. Several food companies will offer samples and information. Visitors can try salsa, pickles, soups, lemonade, seasoning blends, jellies, barbecue sauces, popcorn, sunflower seeds, marinades and more. "Nebraska food companies provide samples to remind their customers about the products and also introduce their products to potential customers," said Jill Gifford, manager of the Food Processing Center's National Food Entrepreneur Program. "This exhibit is a must-see destination for many visitors." Companies scheduled to participate include: Preferred Popcorn, Chapman; Hiland Dairy and Prairie River Honey Farm, Grand Island; Kiehl and Stroh, Hastings; Balabans, Henderson; Hills Sunflower Seeds and Valhalla Bee Farm, Lincoln; Holen One Farms, Loomis; Mellor Seasoning, Omaha; Country Rhoads Jelly, Superior; and Double K Popcorn, Valentine. Fans of the popular lawn-and-garden TV series "Backyard Farmer" are invited to attend a live taping Aug. 30 in the Raising Nebraska Building. A special question-and-answer session with the panelists is 2:30 to 3:30 p.m., followed by the live taping at 4 p.m. The episode will air at 7 p.m. Aug. 31 on NET. Red Out Day is Sept. 3. 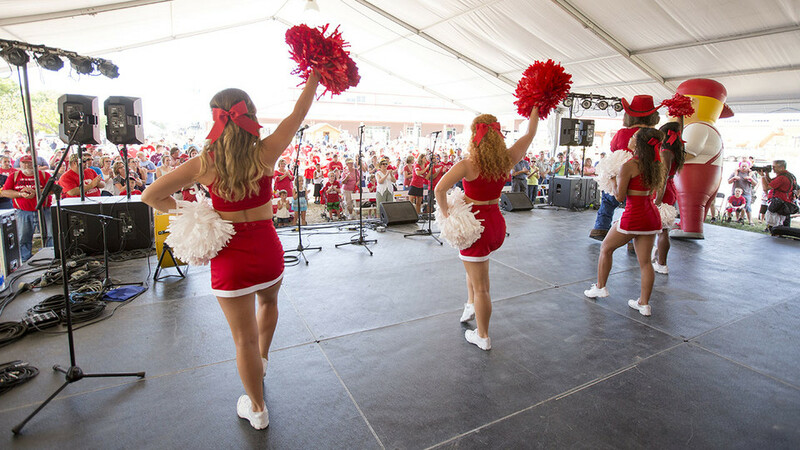 Fairgoers are encouraged to wear red and come to the Family Fun Zone Stage at 4 p.m. for a Husker pep rally. Fans can cheer along with Husker cheerleaders and have the opportunity to win prizes. To follow the event on Twitter, use "#UNLREDOUT."